Welcome to the FMTA FAQ page. What temperature must my landlord keep my apartment at? If you pay for your own heating and have control over it, then it's up to you what temperature you keep your apartment at. Your landlord must maintain the heating system so that it is capable of heating your apartment to at least 21 degrees celcius at all times. If you landlord pays for the heating, then between September 15 and June 1, your apartment must be at least 21 degrees celcius. The rest of the year, there is no minimum temperature for your apartment. Apartments are not required to have air conditioning, but if your apartment does have an air conditioner, then between June 2 and September 14, the apartment must not be hotter than 26 degrees celcius. Can my landlord enter my apartment even when I'm not home? I've heard that my landlord owes me 6% interest on my last month's rent deposit. Is this true? The Residential Tenancies Act removed the right for tenants to collect 6% interest on last month's rent. Instead, the interest charged on your last month's rent will be equal to that year's Annual Rent Increase Guideline amount. The landlord may then add that interest to your last month's rent, as a way of 'topping up' your deposit. If you did not get a rent increase, you are still entitled to automatically deduct the interest on your deposit once a year. Contact the Tenant Hotline for more information. If I stand up for my rights or start a Tenants' Association, can my landlord evict me? 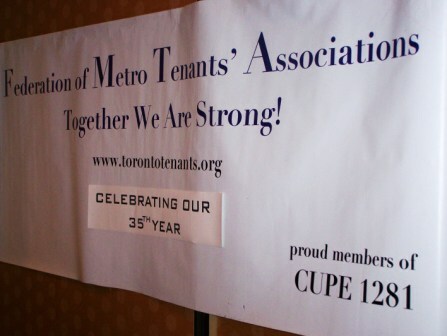 The RTA says that a landlord cannot evict or otherwise interfere with a tenant for attempting to secure their legal rights or for trying to form a Tenants' Association. Remember that there is strength in numbers and your landlord is less likely to retaliate against a group. Click here to download a copy of our Organizing Manual or contact our Outreach & Organizing Team for further help. Every year the Ontario Government publishes an Annual Guideline Amount. This amount is a percentage of your rent. For example, the Guideline amount for 2007 is 2.6%. To search for the Annual Guideline Amount, please click here. Your landlord can apply to the Landlord and Tenant Board for an Above Guideline Increase (AGI) because of an increase in operating costs or to cover major capital expenditures. This increase does not take effect until after the Landlord and Tenant Board has approved your landlord's application and tenants have a right to appear at a hearing in order to dispute the application. If your landlord has applied for an AGI, contact the Outreach & Organizing Team. Is there somewhere I can report a bad landlord? Unfortunately, there is currently no record of 'Bad Landlords', but the City of Toronto does have an online searchable database that allows you to see if there are outstanding Property Standards work orders or by-law violations in your building. To access the database, click here. How can I break my lease? Make an agreement with the landlord to terminate your tenancy (get a copy in writing). Apply to the Landlord and Tenant Board at 416-645-8080. If I am a monthly tenant, and I don't have a lease, is it all right if I only give one month's notice? The Residential Tenancies Act (RTA) says you must give your landlord sixty (60) days notice that you are moving out. This notice must be effective at the end of a tenancy period. This means if you pay rent on the first, you must give notice on the first. You cannot give notice partway through a month. What happens if I don't renew my lease? If you don't renew your lease, you automatically become a month-to-month tenant with all the same terms and conditions of your lease, except for the fixed time period. If my landlord ignores my requests for repairs, can I can just withhold my rent until I get some results? If you withhold your rent, you are likely to receive an eviction notice for unpaid rent. Under the RTA, you may bring up repair and maintenance issues at an eviction hearing. Can my landlord evict me if I have a pet? Under the RTA, even if you sign a lease that states no pets are allowed, you can still have a pet. Section 14 of the RTA specifically voids all "no pets" clauses in a lease. You can only be evicted for having a pet if your pet is disturbing other tenants or the landlord, or is considered a dangerous breed. I agreed to take my apartment "as is", but I never realized how bad it was! Does that mean I have to pay for the repairs, or does the landlord still have to fix up the place? Even if you are aware that an apartment is in need of repairs when you agree to rent it, your landlord is still responsible for taking care of the repairs and maintenance. If you did do the repairs you can apply to the Board for compensation. What if the unit owner refuses to take the Condominium Corporation to Superior Court? A tenant who is unsuccessful in persuading the owner of their residential unit to take action against the condominium corporation has very few options. In certain circumstances, it may be possible for a tenant to apply to the Board in order to seek an abatement of rent from the owner of the residential unit, or get the Board to fine the unit owner. The Board cannot, however, directly coerce the condominium corporation to discontinue ongoing violation of the RTA, as issuing such an order would fall outside the jurisdiction of the Board. Apart from this, the tenant may find legal advice suggesting the possibility of exploring some form injunctive relief, through an application to the Superior Court of Justice. Will an order from the Board force a Condominium Corporation to comply with the RTA? So far, the Board may only issue an order against the "landlord" and the only "landlord" the Board recognizes is the individual unit owner. Because of that, tenants must proceed against the owner of their rental unit even for matters concerning common areas, over which the owner of a unit has no direct control. The simple answer is that an order from the Board is virtually unenforceable against a condominium corporation. However, the Board's order, properly made against the owner of the tenant's residential unit, might then be able to be taken to the Superior Court of Justice - by the respective tenant's unit owner - in order to force the condominium corporation's compliance. This complicated and very expensive remedy has a fairly good chance of failing entirely because the RTA and the Condominium Act contain conflicting provisions as to which legislation takes precedence. For example, past Court decisions with respect to no-pet clauses have caused considerable confusion in Ontario as to which legislation supersedes the other. Can Tenants take the Condominium Corporation or the Property Management to the Landlord and Tenant Board if they don’t comply with the RTA? Tenants of rental units in a condominium can take the owners of the unit that they rent to the Board. The law says that individual unit "landlords" must respect the provisions of the RTA. Tenants who wish to take the condominium's board of directors, or the property manager to the Board will have a very tough time convincing the Board to hear their case of such a matter. The Board doesn't consider the condominium corporation to be the "landlord" and because of this, no tenant has yet been able to take the condominium corporation or the property manager to the Board. Can a unit owner control the common elements of a condominium? Since condominium corporations are controlled by democratically elected boards of directors, an owner can exercise their vote for the board of directors, which would then control the activities of the condominium corporation with respect to the common elements. We call this idea "voting-right control". The reality is that "voting-right control", is often a fallacy. Unless a unit owner owns a substantial number of units, one vote will have virtually no effect on what the condominium corporation does. In fact, as far back as 1971, the California Supreme Court recognized that, "in ordinary course a unit owner does not directly control the activities of the management body set up to handle the common affairs of the condominium project." Who is the Landlord in a Condominium? The only "landlord" currently recognized by the Residential Tenancies Act is the owner of the residential unit which the tenant occupies. The term "landlord" has not been expanded to include condominium corporations even though condominium corporations hold exclusive control over the common elements of the "residential complex". What does the Property Manager do? A board of directors typically grants the power to make day-to-day decisions to a property management company. In most cases, the property management company acts as a legally appointed agent for the board of directors. What does a Board of Directors do? A condominium corporation periodically elects a board of directors from the individual unit owners in the condominium. The members of the board of directors usually serve on a volunteer basis. The board of directors acts as the governing body for the condominium project and has great powers under the Condominium Act. They have control over what is permitted to take place within individual units and what is permitted to take place with respect to the common elements. Common elements in a condominium are similar to the "residential complex" for residential tenants. Common elements include the hallways, the elevators, stairwells, exercise rooms, laundry, etc. In condominiums, common elements also can include the exterior layer of each unit's door in the hallways, the exterior panel of glass on each window in a unit, and the concrete underneath the carpet or beyond the wall finish. Who Controls a Condominium Project? Each unit in a condominium has a clearly specified owner, however: The Condominium Act states that the "duty to control, manage and administer the common elements", is responsibility of the condominium corporation. This responsibility can also include some control over what is allowed within each individual unit. Condominiums are a relatively new form of housing in Canada. A condominium is made up of two fundamental parts: individual units and common elements. Together, they form a condominium project, which is governed by a condominium corporation. Control over the condominium corporation is held by the 'shareholders', who are simply the owners of the individual units. The law that governs condominiums is called the Condominium Act.